« Cookbook Review: Vegan Ethiopian Extravaganza in Teff Love by Kittee Berns, Plus an Interview with the Author! Hi everyone! Rob and I are busy moving into our new house, so today I have a guest post for you written by Trina. Trina has been vegan since early 2014, and in this post she’s going to tell you about her favorite fun way to decide what vegan recipe to cook every day – Vegan Menu Bingo! If you’ve just gone vegan, then you probably find yourself scrambling for new recipes to cook every day. 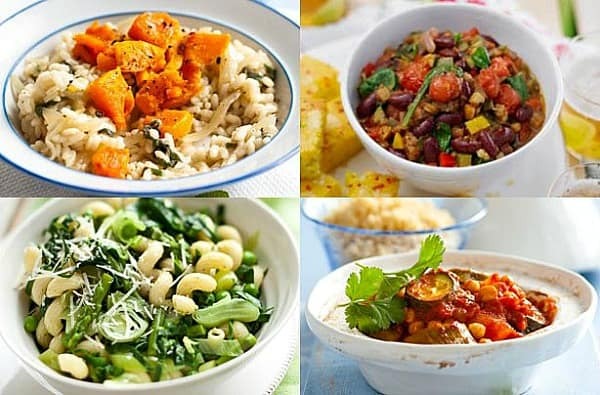 Vegan Runner Eats has plenty of delicious vegan recipes that bust the myth that going vegan can be boring, but it can also be a harrowing experience to try and decide what to cook. Creating a meal plan can be just as frustrating as finding recipes that you’d actually want to try, but today I’d like to present a solution: Vegan Menu Bingo! Bingo has always been a popular game because it lends itself easily to different themes. A few years ago, Brian VanderVeen of Veganachronism came up with a bingo game that poked fun at all the things that omnivores say and ask vegans, and someone has even made an Android app that does the same. Free Bingo Hunter, a website that specializes in cataloguing the myriad of online bingo portals that have emerged following the resurgence of the game, shows that there are now bingo games with themes like Saturday Night Takeout. You can use the game to create a custom meal plan every day too. 1. Collect a list of your five favorite recipes for each of the following categories: Breakfast, Lunch, Light Snack, and Dinner. 2. Use a free bingo card generator like the one on Print-Bingo.com, or create your own bingo card, and lay out the names of the recipes so you have one column for each category. 3. Print out the card and number the items in each category from 1-5. 4. In the morning, bring out your card and roll a die for each category, keeping note of which recipe corresponds with the number you rolled. If you happen to roll a 6, pick freely from the list. Mark off the items – this is your meal plan for the day. 5. Repeat #4 for each day of the week. If you roll a number that corresponds to a dish you’ve already cooked that week, either reroll or take your pick from the remaining dishes. When you take the guesswork out of making up your mind what to eat for breakfast, lunch and dinner, life can become that much easier! Ever since going vegan in early 2014, Trina Nguyen has been on the search for ways to make the transition easier. When not writing about and trying Vegan recipes she finds online, she enjoys visiting various Pick-Your-Own farms for fresh, organic ingredients! Thank you Trina for sharing such an interesting idea for vegan menu planning, and good luck on your vegan journey! Question for you: Do you prefer planning out your meals for the week, or do you decide what to cook on a day-to day basis? What helps you in planning your daily/weekly menu? Please share in the comments below! Stay in touch for more tips on healthy and fun vegan living! Follow Vegan Runner Eats by subscribing in the top right corner of this post, or by connecting with the blog on Facebook, Twitter, Google+ and Instagram! Tagged guest posts. Bookmark the permalink. Great post! I love this idea! It helps to break up the monotony of cooking and eating the same foods all of the time, which is what I often do. It’s good to shake things up in the kitchen and delight the palate with different delectable vegan dishes. Thanks Deborah! I often get caught in a rut with my meals too, so this should be a fun game to try out! What a fun idea! And good luck with the house move. Thank you Sarojini, we’re almost there! There are several reasons I need to plan meals for the week. First, I’m lucky enough to be the one who does NOT do the grocery shopping! So I have to provide love-of-my-life with a comprehensive shopping list. I don’t know if I’m allowed to say it here, but I use plantoeat.com. I need to save time, money, and calories (second reason) and this site generates the shopping list, and all. I couldn’t live without it. I can see a month at a time and I will drop and drag so that recipes aren’t repeated too often. Because Deborah is right, monotony isn’t so good! So this really allows me to the make sure, at a glance, that I’m keeping it fresh. I also strive to try at least one new recipe every other week (or more often if I find good ones) 😉 Great article! Susan, I know (almost) all about comprehensive shopping lists! It’s funny because if I ask Rob to stop by the store and get bread, he’ll come home with one loaf of bread. If I go to the store to buy bread, I’ll come home with 2 bags chock-full of food! I am responding to Alina’s question above. I like to write a dinner menu plan for each week. I do this on Friday or Saturday afternoon. This helps me plan my shopping list for the Sunday farmer’s market. I try to be a bit flexible in case there is something new and very tempting at the market each week. To supplement my favorite vegan cookbooks (Veganomicon and The Great Vegan Bean Book), I have loose leaf binders with recipes from Alina (vegan runner eats), Susan Voisin (fat-free vegan kitchen), and other fat-free vegan recipe online sites. Of course, I tweak all the cookbook recipes to be fat-free. Sandy, I’m glad to hear that you store my recipes along with the recipes of such vegan greats as Isa Chandra Moskovitz, Susan Voisin and Kathy Hester! I should adopt your habit of putting together a meal plan for the week in advance though. Maybe Rob will be interested in playing vegan bingo with me!